There is one skeleton in the basement of the mansion. Each level of Bonfire Intensity will spawn one more skeleton (max 8) and each has a 100% chance to drop a Human Effigy. Six in total in the dark tunnel leading to the Soldiers' Rest bonfire. Only in Dark Souls II: Scholar of the First Sin. They dwell in the cave just after the Undead Lockaway bonfire. Four of them with a Thrusting Sword & Shield will spawn after killing the Skeleton Lord wielding the Roaring Halberd during the boss fight. Seven in total are found in the Executioner's Chariot boss arena, along with two Necromancers. There are four of them at the beginning of the Valley. Three additional Skeletons spawn at Bonfire Intensity 2+. Two in the first gravestone room past the Undead Ditch bonfire and a third in the next small room. Only in Dark Souls II: Scholar of the First Sin. Several can be summoned by Elana, the Squalid Queen during her boss fight. Falchion (Curved Sword) - rare. Mail Breaker (Thrusting Sword) - rare. Foot Soldier Shield (Shield) - uncommon. Long Bow (Bow) - rare. Wood Arrow x3 (Bow) - common. Human Effigy (Majula, Huntsman's Copse) - guaranteed in Majula. Uncommon in Huntsman's Copse. Titanite Shard (Harvest Valley) - Dark Souls II: common. Scholar of the First Sin: rare. Titanite Shard (Undead Crypt) - Scholar of the First Sin: common. 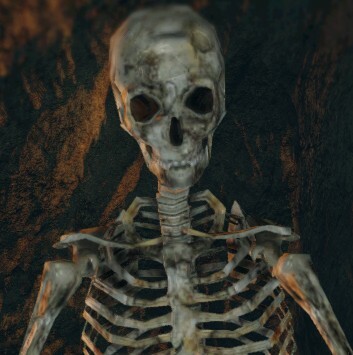 The ones located in the Huntsman's Copse and Undead Purgatory will keep reviving as long as the Necromancer near them is still alive. On rare occasions, both variants of Skeletons can parry and riposte you. They have a custom, unique riposte animation. Critical attacks with Daggers, Thrusting Swords, Halberds and Spears have next to no effect on them, dealing abysmally low damage. On the other hand, blunt weapons work wonders on them, so much that an unupgraded Mace wielded with its bare minimum requirements will effectively deal more damage than a Dagger or a Rapier.